On behalf of WCF, I hope your new year is off to a positive start. 2014 was a defining year for WCF and I want to reflect on some of our achievements in order to inform and motivate our work in the year ahead. Last February, I had the opportunity to visit Japanese company members in Tokyo. In addition to private meetings, we organized a reception to share new information on our West Africa CocoaAction strategy and to learn more about the interests and needs of our members there. In March and April, WCF facilitated workshops in Côte d’Ivoire and Ghana with government agencies to further develop the CocoaAction strategy in close coordination with their national goals and priorities. WCF co-hosted the Indonesian International Cocoa Conference in Bali, Indonesia alongside ASKINDO, which gave us another opportunity to engage with Asian members and stakeholders. CocoaAction was officially announced in May with MOU signings with the governments of Ghana and Côte d’Ivoire. This was followed by WCF Board of Directors field visits to a number of cocoa sites. In June, we gained valuable feedback from our stakeholders during membership panel presentations at the ICCO World Cocoa Conference in Amsterdam and Chocovision in Davos. In the second half of the year, West Africa faced an Ebola crisis. With the generous help of our company members, WCF raised more than $800,000 to support relief and prevention efforts. Our contribution is being managed by Caritas and the International Red Cross and Red Crescent Societies. WCF’s 26th Partnership Meeting took place in Copenhagen in October which focused on cocoa standards and certification and the relationship with sustainability. To conclude 2014, the first CocoaAction-KPI workshops were held in both Côte d’Ivoire and Ghana resulting in an agreement to continue working together with local government agencies on performance measures and the formation of a committee tasked with this work. I look forward to working together over the next year to meet these priorities and continue the great work of supporting farmers and ensuring the sustainability of the cocoa industry for many years to come. In cocoa producing areas of rural West Africa, it can be easier to buy a scratch card for any mobile telecommunications service provider than it is to buy agro inputs. This situation persists because of inefficient and underdeveloped input supply systems in markets dominated by government subsidies. The Spray Service Provider (SSP) concept is changing that landscape. When cocoa farmers are able to obtain agro chemicals, neither the quality of these chemicals nor their safe application is guaranteed. To improve accessibility and increase responsible use of good quality agro inputs in the cocoa sector in West WCF’s African Cocoa Initiative (WCF/ACI) piloted the Spray Service Provider concept. The concept was implemented by CropLife Africa Middle East through its national affiliates in Cameroon, Côte d’Ivoire, Ghana and Nigeria between January 2013 and December 2014. 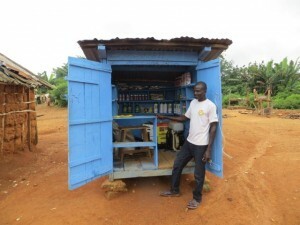 The concept is changing how cocoa growing communities manage pest control. A Spray Service Provider is a farmer who has received special training to safely apply approved pesticides and who rents out his services to fellow farmers to spray their lands. The goal of the program is to ensure that untrained farmers no longer handle pesticides, and that this application will only be undertaken by those who are properly trained. The SSP concept counts towards WCF/ACI’s main goal of improving the accessibility of good quality agro inputs/fertilizer to farmers in the cocoa sector in West and Central Africa to help increase productivity. Through the implementation of the program in Ghana, more than 18,000 cocoa farmers have used the services of the SSPs to date. In addition, some SSPs have established small businesses and are making a decent living from their activities. Rahim’s activities as SSP have earned him additional income: “I have four young children, so with the extra money I can take better care of them.” The additional income can help support his children’s education. The SSP program also plays a critical role in reducing the chance of child labor in cocoa communities. The program makes it less likely that children will be involved in the application of pesticides and other agro-chemicals in WCF/ACI beneficiary communities. SSPs are trained and certified adult farmers or agro-dealers that provide agro-chemical application services to farmers for an agreed fee. SSPs also institute empty container management schemes. These actions help to keep these containers out of the reach of children and assist in minimizing the risk that children will be exposed to harmful chemicals used in cocoa production. Read a press release describing the WCF-CropLife partnership here. Women working to clear the school garden plot. 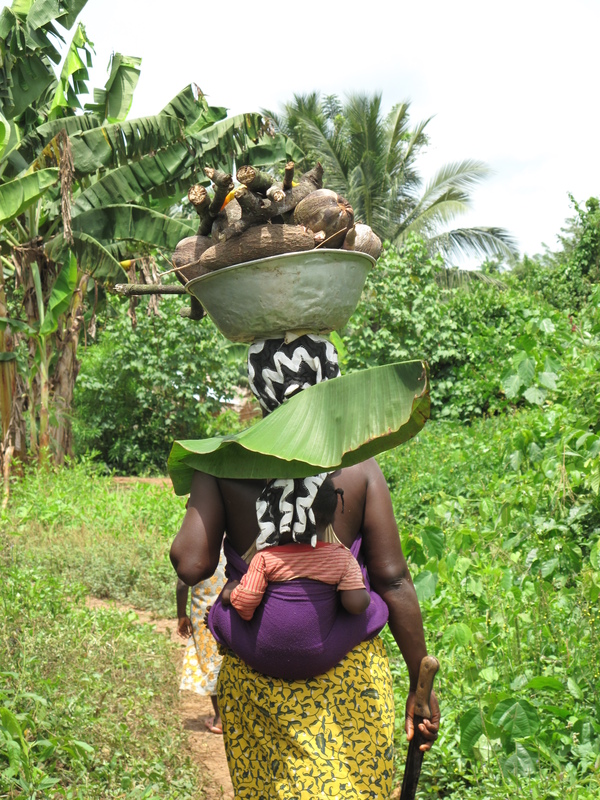 Women in cocoa-growing communities in West Africa have many household and agricultural responsibilities, including growing food for their children and families. Even small increases in productivity and efficiency can mean large increases in quality of life for the women and, by extension, their entire families. In WCF/Nestlé School Project-supported communities in Côte d’Ivoire, women are improving their productivity by using modern farming techniques, or Good Agricultural Practices (GAP), on their community school gardens. Many of the women in a local Women’s Association in Koffikro, for example, are using a nursery for the first time to germinate eggplant and pepper seedlings before planting them in the field. This guarantees the success of each seed, resulting in a more prosperous and efficient harvest cycle. Most significantly, local Field Agents taught women in Koffikro proper and safe pesticide use for application in the school garden. The Field Agents learned that the group was unaware of the serious health risks of direct exposure to pesticides and were spraying their garden without adequate training or protection. The Field Agents prioritized training on proper pesticide handling and explained the dangers of the products, particularly for children, if used incorrectly. Through the safe application of pesticides and other good agricultural practices, the women are able to harvest more, provide for their children and families, and keep their families healthy. 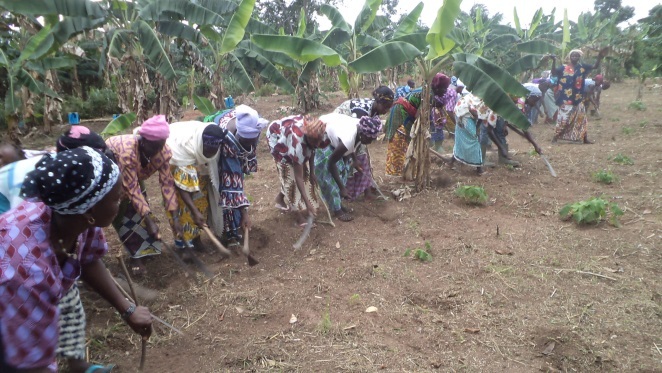 As the secretary of the Koffikro Women’s Association Olga Yobouet Akissi noted, the new skills will help them “continually improve” the school garden each year, which will eventually spread to their own home gardens and other communities. Food security in West Africa is a significant challenge to both the prosperity of cocoa growing communities and the potential for developing sustainable cocoa production in the future. While most cocoa farming families do produce some food crops for household consumption, the majority of cocoa farmers are dependent on cocoa production for their livelihoods. Seasons of low productivity or falling cocoa prices can place significant strain on cocoa farmers. The WCF Cocoa Livelihoods Program (WCF CLP) is addressing food insecurity by assisting farmers in diversifying their farming practices and improving the productivity of key food crops on their cocoa farms. The ten year program (2009 – 2018) provides training and resources to improve existing cocoa production and to include strategic food crops for personal consumption into their farm’s portfolio. Based on farmer demand, WCF is targeting key food crops typically grown in cocoa communities, including cassava and plantain as well as soy and vegetable crops. 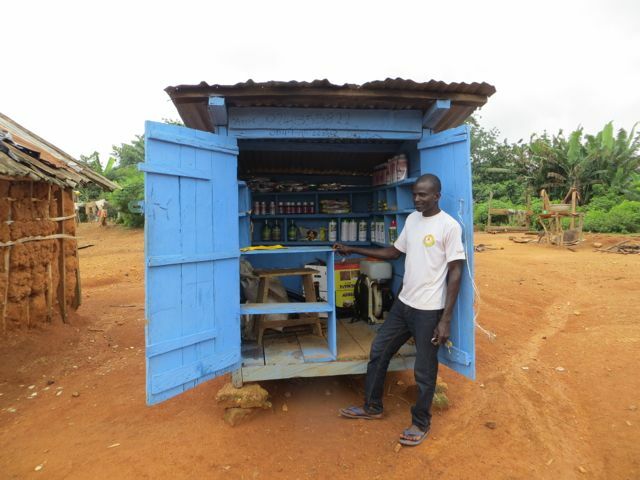 Farmers are also trained in business skills to better manage and diversify their farm activities and income sources. 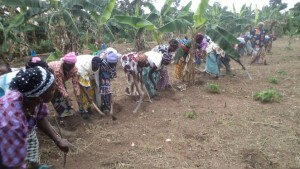 In total, WCF CLP will reach 200,000 farmers in Côte d’Ivoire, Ghana, Nigeria and Cameroon. WCF is collaborating with national extension services including the Ministries of Agriculture and Development in Ghana and Nigeria, and ANADER in Côte d’Ivoire, as well as national and international programs to support the food productivity program. Importantly, women are typically responsible for 80% of food crop production in the household. Therefore, with the support of the Walmart Foundation, WCF CLP is directly targeting women farmers with training and resources. Through the training and support of the program, women have the potential to gain greater financial independence through the sale of the food crops. This, in turn, will directly benefit the entire household. With the support of WCF CLP, cocoa farming families are increasing the productivity of both cocoa and food crops on their farms. Men and women farmers are learning the skills to better manage their farms and they are becoming more resilient to predictable and unpredictable challenges in the cocoa growing belt. Monitoring experts use WCF’s Farm Information Toolkit to make light work of farm monitoring. In 2012 WCF’s Board of Directors agreed to: “help member companies ensure they have credible, consistent data collection methods on farm practices and sustainability – methods that can be implemented in each company program so that, over time, we can measure our impact”. WCF’s efforts on this mission continue with the recent testing and successful implementation of the Farm Information Toolkit (FIT) – a modular, open-source toolkit for use by monitoring and evaluation experts at WCF member companies to consistently measure and monitor farm practices, productivity, and sustainability. February brings the latest challenge in adapting the Toolkit for use on cocoa farms to rapidly measure and evaluate how well farmers are adopting farming practices they have learned. These Good Agricultural Practices (GAP) — practices that promote higher cocoa yields, control pests and diseases, and maintain trees for sustainable productivity year after year – are vital for improving farmers’ livelihoods. 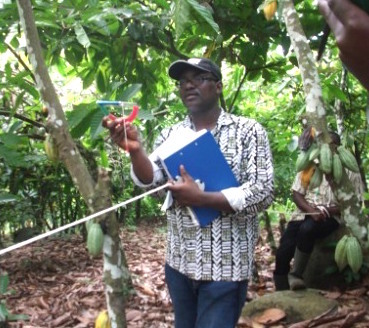 WCF’s Cocoa Livelihoods Program (CLP) is collecting farm sustainability measurements on more than 800 farms across West Africa, using the Farm Information Toolkit to record farm practices in February. These farms will be monitored over the next five years under this program, funded by the Bill and Melinda Gates Foundation. Increased farm-level cocoa productivity to average of 1,000 kg/ha. Improved service delivery efficiency with focus on long-term, farm-level cocoa productivity increase. With FIT, our monitoring experts employ “mixed methods” of gathering information on farm sustainability. This approach uses both traditional farmer surveys, plus direct observations on the farm. The Toolkit is developed to be as simple and quick to use as possible, while producing statistically sound data. FIT is open-source, meaning WCF will share these methods and tools and continue to improve the Toolkit with partners in coming years. WCF’s Monitoring and Evaluation Coordinator, Edwin Afari, measuring cocoa best practices. One of the most unique features of FIT is the construction of the measurement tools themselves. Tools to measure tree height, proper pruning, shade management, and other farm practices are hand-made from materials sourced locally in farming regions of West Africa. The FIT manual provides a recipe-like approach to constructing all needed measurement equipment for a fraction of the cost of buying professional measurement tools. In this way, WCF trains surveyors to use rope, colored tape, PVC piping, and other materials to construct their own farm measurement toolkit for approximately $40 USD. These tools have been field-tested and shown to perform as well as agroforestry tools costing hundreds of dollars. 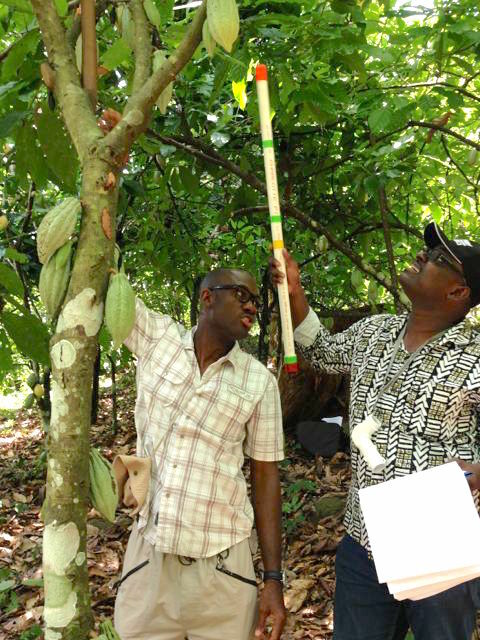 Extensive documentation and manuals provide expert advice on how to use the toolkit to measure what truly matters for sustainable cocoa farming. WCF is pleased to share this innovative approach with our member companies participating in our Cocoa Livelihoods Program and CocoaAction. As an open-source toolkit, FIT will become available on the web for all to use in the near future. From left to right: Phuoc Pham, Senior Lecturer & Project Manager, Nong Lam University HCMC, National Cocoa Development Coordinating; Virginia Sopyla, Associate Director, Southeast, Latin America & Research; Rozita Osman, Research Officer, Malaysian Cocoa Board; Romulo Cena Professor VI & Director, University of Southern Mindanao Agricultural Research Center (USMARC); and Noor Febrianto, Researcher, Indonesian Coffee & Cocoa Research Institute. 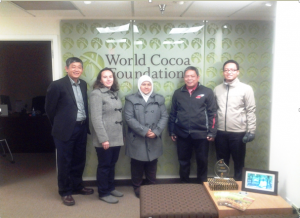 On December 6, 2014 four individuals visiting from Malaysia, Indonesia, the Philippines, and Vietnam arrived in Washington, D.C. to partake in the Cocoa Cochran Fellowship in the form of a two week study tour. The Fellowship brings mid-career to senior-level professionals from cocoa producing countries to the United States to enhance their technical knowledge and skills. The program is run jointly by WCF and United States Department of Agriculture/Foreign Agricultural Service (USDA/FAS). This year, the area of focus was genetic resource management. To learn more about this particular topic, the Fellows visited USDA facilities in Maryland, Florida, and Puerto Rico. Throughout their stay they met with scientists, researchers, and other key members in the cocoa and chocolate industry to exchange experiences and ideas in hopes of advancing their own projects back home with new information. What was the most valuable aspects of the Cocoa Cochran Fellowship to you? Meeting with many leading scientists from USDA who are intelligent and dedicated to their work. They published a lot of papers in highly respected journals and are willing to share their experiences with us, as well as collaborate on research projects. What did you learn during your Fellowship that you hope to adapt at your home institution/organization? A lot. I am amazed with the application of information technology in the management of cocoa genetic and germplasm of cocoa. Our institution is in the possession of a lot of valuable records and information that need to be stored and managed well. I hope with the application of information technology, we can manage it more easily to make it more accessible; not only for ourselves but also for the general public as well. The next group of Cocoa Cochran Fellows is expected in June. The focus of the program will be “quality”, and will invite professionals from the Latin American region. Dr. Isidro E. Suarez, a Professor of Plant Biotechnology at the Universidad de Córdoba in Colombia, was selected as one of the final candidates for the Cocoa Borlaug Fellowship in Fall 2014. He completed a four-month Fellowship at the United States Department of Agriculture-Agriculture Research Station (USDA-ARS) in Miami, Florida researching single nucleotide polymorphism markers (SNPs). 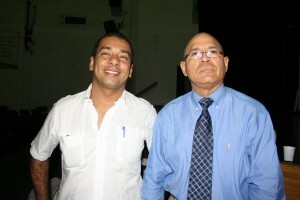 Dr. Osman Gutierrez, Research Geneticist at USDA-ARS, served as his mentor and assisted him in carrying out his research. The Norman E. Borlaug International Agricultural Science and Technology Fellowship Program/Global Cocoa Initiative supports the exchange of cocoa scientists from the Americas, Southeast Asia and Africa. The program sponsors Fellows from the science field to complete a two to three month research Fellowship in the United States, acquiring skills and knowledge that can be shared with their colleagues. This program is supported by World Cocoa Foundation and USDA/FAS. Isidro Suarez (Left), Professor of Plant Biotechnology, Universidad de Córdoba; and Osman Gutierrez (Right), Research Geneticist (Plants), United States Department of Agriculture ARS. Colombia is famous for its coffee, however, cocoa is also a growing part of the agriculture industry. However, Suarez writes in his final report there are few breeding programs designed to meet the needs of growing cocoa in new areas of Colombia. Thus, the main focus of Suarez’ Fellowship was to gain more knowledge and training in the use of SNPs which facilitate a more efficient breeding process. The knowledge of SNP technology will help him start a new breeding program that will screen larger numbers of genotypes, and map the gene structure of several cacao collections in Colombia. During his Fellowship, Suarez analyzed DNA extracted from cacao cultivars with pools of SNPs which were developed for several cacao specific loci. In total, he utilized 465 DNA samples extracted from cacao cultivars imported from Tabasco, Mexico. Though the research is ongoing, Suarez stated in his final report that the experience helped him learn more about SNP technology and how it could be applied in cocoa for marker assisted selection breeding programs. The next group of Cocoa Borlaug Fellows are expected to arrive in May and June. Interviews to accept more candidates from Latin America, Africa, and Southeast Asia for the rest of the year are currently underway. June 30 – July 1: 27th Partnership Meeting & Cocoa Sustainability Trade Fair, Washington, D.C.
WCF congratulates staff member Victoria Woolner on her new role at WCF as Program Assistant, CocoaAction. Victoria is based in the Washington, D.C. office. WCF thanks outgoing Board of Directors members Juan Fernando Valenzuela of Compañía Nacional de Chocolates and Francisco Gomez of Casa Luker for their service and dedication. WCF welcomes Mary H. Johnson of Transmar Group and Nana Amo Adade Boamah of Cocoa Merchant Ghana Ltd. to the WCF Board of Directors effective January 1, 2015.